I was chatting to a @clarecook this morning – office mate and all round planet brain – and we got onto the subject of how we use Twitter to find people. Clare noted that often she will follow people based on a conference or event that she saw them at. I recognise that approach. I often put on a glut of ‘following’ before, during and after events as you track the run-up and aftermath. If you’re organised then you could have lists but lists don’t seem granular enough to cover the range. Really what you need is a way to tag followers. When I follow someone, it would be great if there was a pop-up that allowed me to tag them. I could add my own or select from a number of tags generated from their recent feed. That might help if I want to search for people tweeting around a conference etc. It would also allow me to do that by actual hashtag for the same reasons. 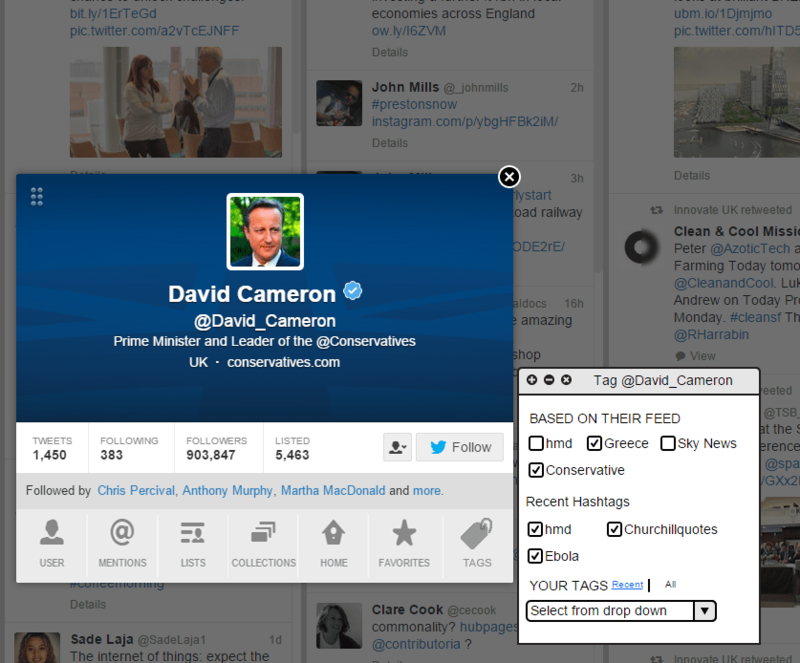 Once followed you could search by tag and even identify the tags picked at the time you followed them. In one respect this is the opposite of how many people want to use twitter. Any tools are about filtering the stream to get current information. But Twitter is meant to be a communication platform – a follower list is as much a list of contacts as it is a list of sources. A convenient way to search your contacts based on context that’s more granular than lists doesn’t seem like too odd an idea to me. Now, there may be an app that already does this. If so, we’d love to know.